One thing that sets Hi-Wire apart from some of Asheville's other young breweries is that they will bottle and distribute six-packs from the get-go. A local artist designed all the labels and packaging, an eye-catching collection of artwork that will pop on the shelves and help with brand recognition in these early stages. Brewer Luke Holgate will man the 25-barrel brewhouse, and with room to grow, Hi-Wire could easily distribute beyond the Asheville city limits when the time comes. 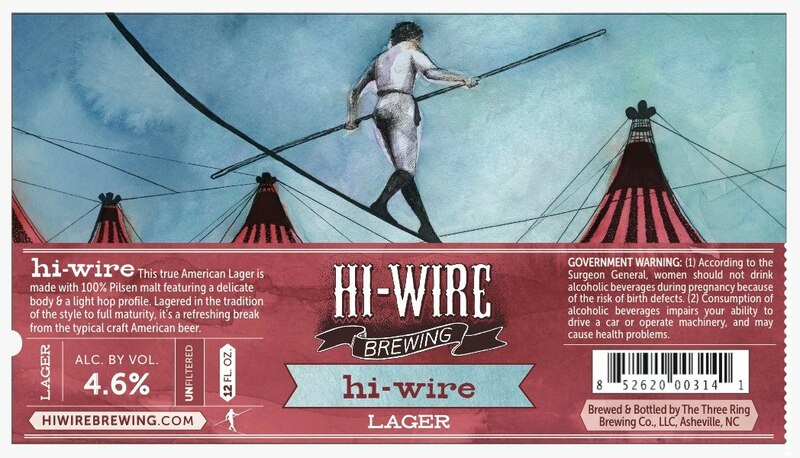 Despite their plans for distribution, Hi-Wire will remain firmly rooted in Asheville. Their taproom will be a warm and welcoming space, complete with foosball, shuffleboard, life-sized Jenga -- even old-school Nintendo. They're reusing lumber from old farms in the Mills River area to build not one, not two, but three taproom bars. The repurposed lumber and open air seating should lend a space a rustic, inviting vibe. In addition to the four year-round beers mentioned above, Hi-Wire will serve a number of seasonal and one-off brews in the taproom. Hi-Wire aims to please the local crowd and is excited to be part of Asheville’s rapidly developing “brewery district”. Given its proximity to three existing breweries (Asheville Brewing Company, Wicked Weed, & Green Man) and three breweries soon to open (Burial Beer Co., Twin Leaf, Ben's Tune-Up), Hi-Wire will be easily accessible to anyone walking around downtown. The reception by the local Asheville beer community has been "better than we could have imagined," said Carnarck. Several breweries have offered advice, services, and supplies to help their newest comrades get off the ground. I expect that the Asheville public to be just as welcoming. Don't miss the Hi-Wire tap takeover at the Thirsty Monk on May 31st, prior to their official debut at the Beer City Festival on June 1st.